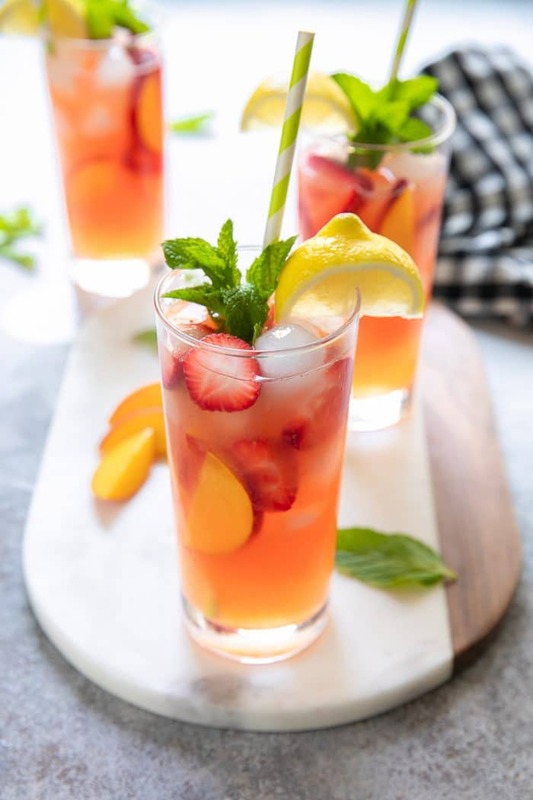 This Summer Peach Strawberry Lemonade Recipe made with juicy strawberries and sweet summer peaches is a must have during the hot summer months. 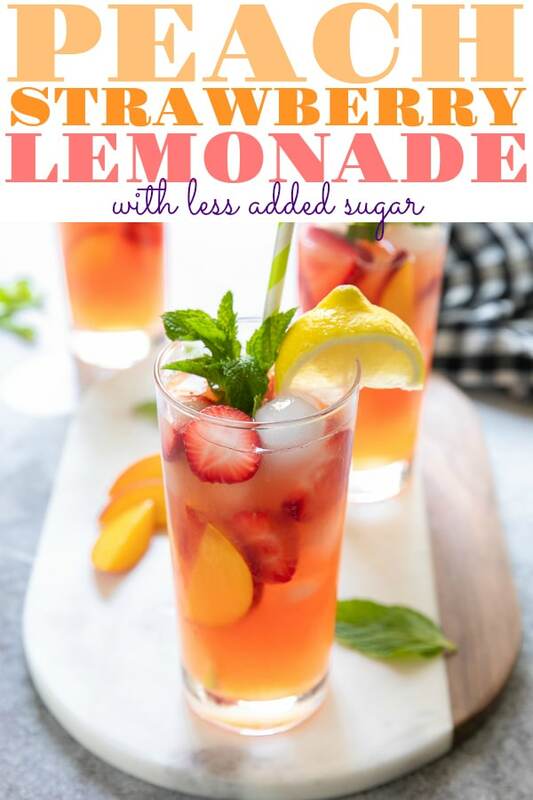 Made with fresh fruit and less added sugar, this homemade lemonade recipe is guaranteed to keep you cool all summer long. 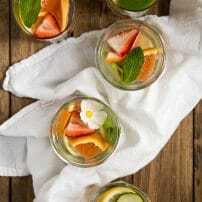 Fun and refreshing summer drink recipes, like this Summer Peach Strawberry Lemonade, Watermelon Limeade (with no sugar added) and Blood Orange Kombucha Spritzers, are my favorite way to stay cool during the blazing hot summer months. Noticing a lack of non-alcoholic summer drinks here on this little blog of mine, I decided it was time to add some kid-friendly drinks. 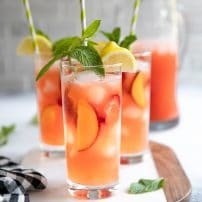 Loved by both kids and adults, this Peach and Strawberry Lemonade Recipe is made with fresh pureed peaches and strawberries, fresh lemon juice, and minimal amounts of sugar. 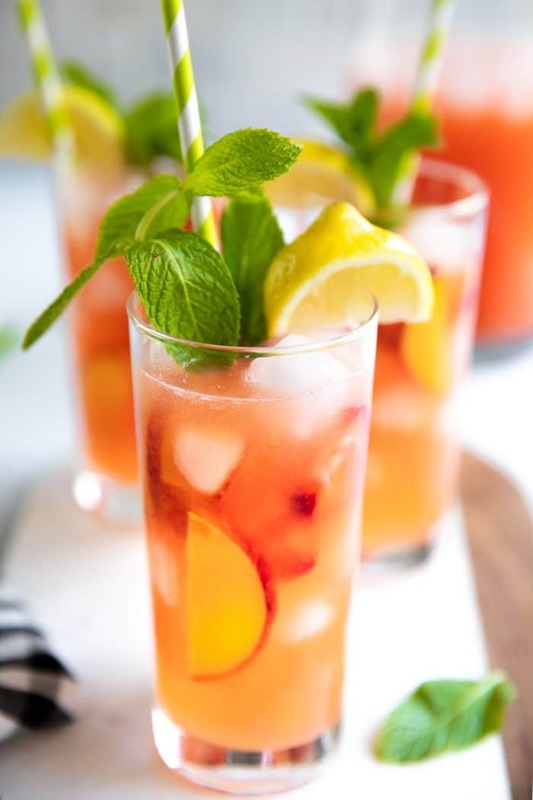 Best made in large batches, this delicious strawberry lemonade is perfect for a large group, or kept stored in the refrigerator to enjoy all week long. Since we’re making lemonade, lemon juice should be a pretty obvious addition to the strawberries and peaches. Do not use lemon juice concentrate. I mean, you can. No one will stop you. However, this fresh homemade lemonade with less sugar just tastes better with the fresh stuff. The same goes for the peaches and strawberries. Now, normally I am all about using frozen or even canned fruits. They eliminate waste and lock in nutrients. However, visually, the lemonade will look a little different if you use frozen or canned fruit. Less crisp and clear, and a whole lot cloudier. If this doesn’t bother you, or frozen peaches and strawberries are all that’s available, that’s totally OK, too. The lemon juice, however? Keep it fresh. Get some fresh, ripe, and seasonal fruit. Make sure the fruit is ripe. Not rotten, but ripe and sweet. 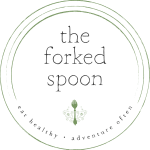 Chop into large chunks and puree in a blender or food processor. Strain the puree through a fine mesh strainer to separate any unprocessed bits of skin or seeds. Mix it all together in a large pitcher with ice. Even though there are several steps involved in making your own homemade lemonade, they are so incredibly easy to do and take very little time. Besides, the reward is a giant pitcher of peach strawberry lemonade, so it’s totally worth it. 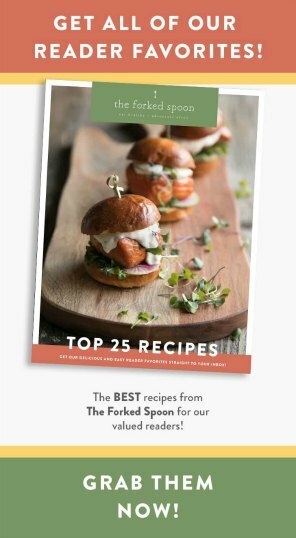 There are a bunch of different ways to make this recipe unique and totally different. Top off with soda. Ginger ale or lemon-lime soda are highly recommended. Give ’em a little booze. Yes, alcohol. Hard cider, champagne, rosé, or rum would be my top picks. Add more sugar for a sweeter drink. 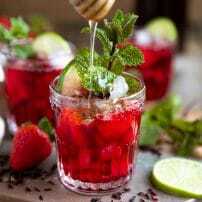 Make a flavored simple syrup to give it a deeper fruity flavor. Add a different herb. Truth- I wanted to add basil as the garnish but my plant died from the summer heat, so mint it would be. Rosemary would also taste terrific. Try different fruits. Peaches only come around a couple of months out of the year, if you can’t get your hands on any, try something more seasonal like raspberries or cherries. 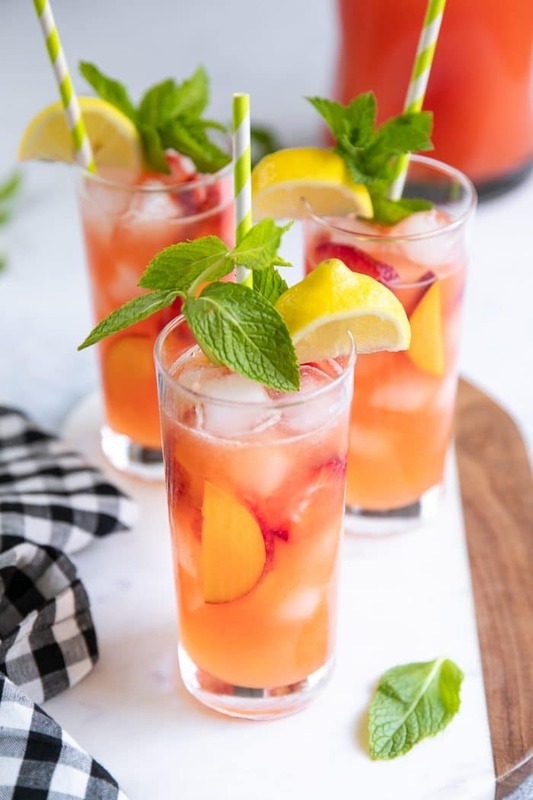 If you try making this Peach and Strawberry Lemonade, please leave me a comment and let me know! I always love to hear your thoughts. 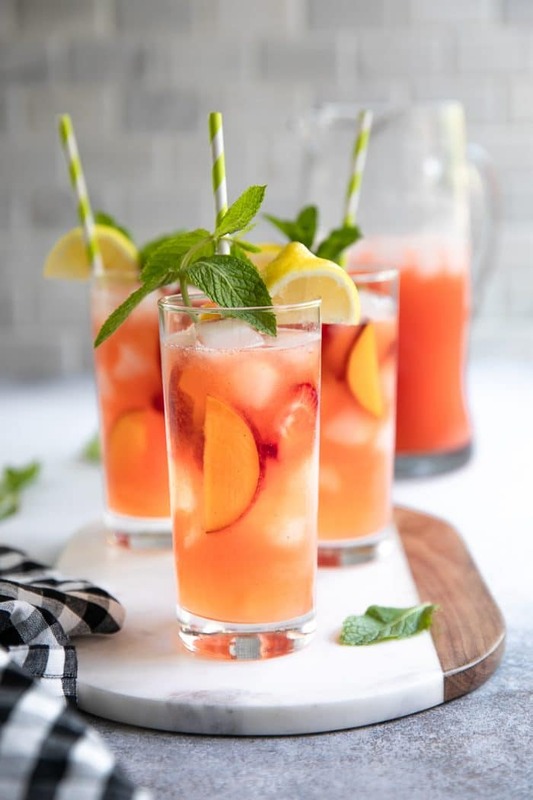 DON’T FORGET TO PIN AND SHARE THIS PEACH AND STRAWBERRY LEMONADE RECIPE AND ADD IT TO YOUR NEXT WEEKLY MEAL PLAN! 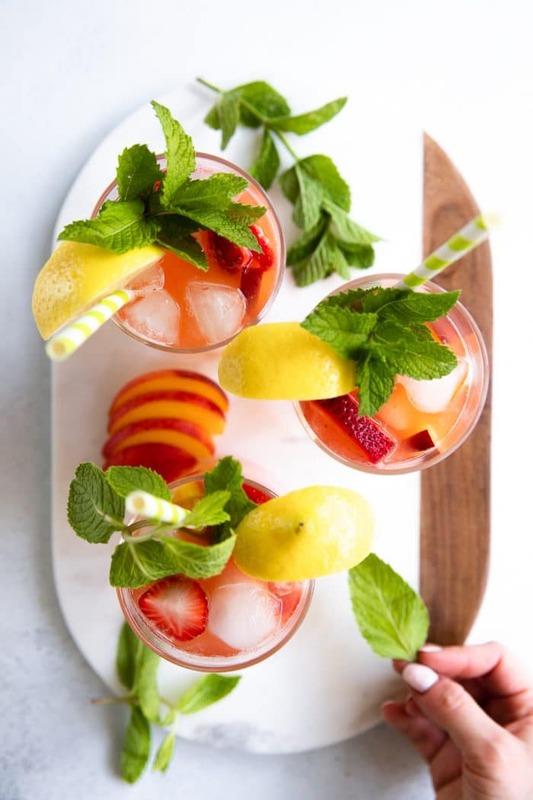 Loved by both kids and adults, this Peach and Strawberry Lemonade Recipe is made with fresh pureed peaches and strawberries, fresh lemon juice, and minimal amounts of sugar. Add the peaches, strawberries, and water to the bowl of a large blender or food processor and process until pureed. Pour the pureed peach and strawberries through a fine mesh strainer and into a large bowl. Use a spoon to help push the puree around and through the strainer (see notes). DIscard any bits remaining in the strainer and set bowl aside. Add the granulated sugar and water to a small saucepan over medium heat. Bring mixture to a low boil, stirring occasionally. Allow mixture to boil for 3 minutes or so, or until mixture becomes syrupy. Set aside to cool. Fill a large pitcher with ice. Add the fresh lemon juice, peach and strawberry puree, and simple syrup. Mix well to combine. Fill with water (approximately 6-8 cups) and stir well. Cover and store in the refrigerator until ready to serve. 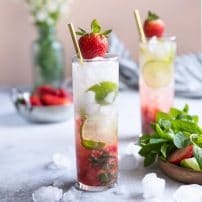 When ready to serve, serve in glasses with ice and desired garnishes. Enjoy! I pureed my fruits in my Vitamix. This blender blends so well that I didn't have much leftover seeds or skin left behind in the strainer. If this is you, that's ok, you didn't do anything wrong. 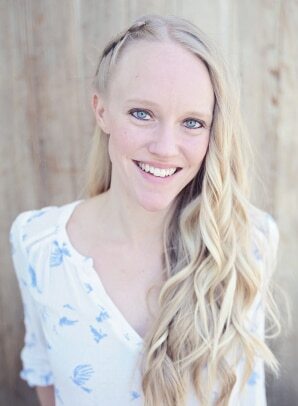 Jessica, thank you so much for allowing me to feature your Peach Strawberry Lemonade in my peach round-up post! It looks so refreshing and delish. I can’t wait to try it and add some rose’ to mine! Have a great day!